The Council of Four from left to right: David Lloyd George, Vittorio Emanuele Orlando, Georges Clemenceau and Woodrow Wilson in Versailles. The Big Four or The Four Nations refer to the four top Allied powers of the World War I  and their leaders who met at the Paris Peace Conference in January 1919. The Big Four is also known as the Council of Four. It was composed of Woodrow Wilson of the United States, David Lloyd George of the United Kingdom, Vittorio Emanuele Orlando of Italy, and Georges Clemenceau of France. Portrait of Thomas Woodrow Wilson, 1919. 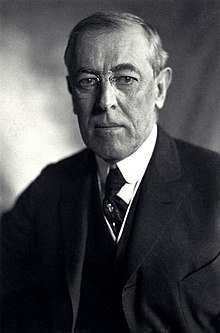 Woodrow Wilson (28 December 1856 – 3 February 1924) was elected President of the United States on the basis of domestic issues in 1912, and re-elected in 1916. He based his 1916 re-election campaign around the slogan "he kept us out of war", and had worked hard to broker a compromise peace. In early 1917 Berlin decided to launch all-out submarine warfare designed to sink American ships bringing supplies to Britain; in the Zimmermann Telegram it proposed a military alliance with Mexico to fight a war against the US. The nation was poorly armed when it went to war in April 1917, but it had millions of potential fresh soldiers, billions of dollars, and huge supplies of raw materials needed by the Allies. Officially Wilson kept the US independent of the Allies. In 1918 Wilson took personal control of negotiations with Germany, including the armistice. He issued his Fourteen Points, his view of a post-war world that could avoid another terrible conflict. It had an enormous impact on both sides in Europe, and made him the man of the hour in Paris. A leader of the Progressive Movement, he assembled a high-powered group of academic advisors to help him in Paris but his distrustful personality led him to break with a series of close advisors, most notably Colonel House. He made a major blunder by refusing to bring along any prominent Republicans to Paris, which politicised the American debate and weakened his support. His main goal was a long-term solution to end warfare based on the League of Nations and self-determination of nations. He paid special attention to creating new nations out of defunct empires, and was opposed to harsh terms and reparations imposed on Germany. A Presbyterian of deep religious faith, Wilson appealed to a gospel of service and infused a profound sense of moralism into his idealistic internationalism, now referred to as "Wilsonianism". Wilsonianism calls for the United States to enter the world arena to fight for democracy, and has been a contentious position in American foreign policy. David Lloyd George, former Prime Minister of the United Kingdom. 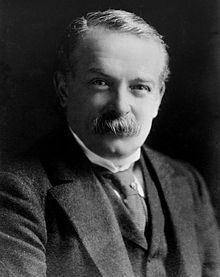 David Lloyd George, (1863–1945) from the British Liberal Party was a highly effective leader of the coalition government that took power in late 1916 and managed the British war effort. However his coalition premiership was supported more by Conservatives than by his own Liberals, and the subsequent split was a key factor in the decline of the Liberal Party as a serious political force. He won by a landslide in the election of 1918, held just after the war ended, where he spoke out for harsh terms against Germany. However, he was much more moderate at Paris. Unlike Clemenceau and Orlando, Lloyd George did not want to destroy the German economy and political system—as Clemenceau demanded—with massive reparations. When asked how he had done at the peace conference, he commented, "Not badly, considering I was seated between Jesus Christ and Napoleon [Wilson and Clemenceau]." It has been said that "Lloyd George was the most affable and the most resilient, and he was probably the best at negotiating". In an article from the New York Times, it says that "Lloyd George was a pragmatist determined to protect and expand the interests of the British Empire." Vittorio Emanuele Orlando, prime minister of Italy. Vittorio Emanuele Orlando (19 May 1860 – 1 December 1952) was an Italian diplomat and political figure. He was born in Palermo, Sicily. His father, a landed gentleman, delayed venturing out to register his son's birth for fear of Giuseppe Garibaldi's 1,000 patriots who had just stormed into Sicily on the first leg of their march to build an Italian state. He is commonly nicknamed "The Premier of Victory". In 1897 he was elected in the Italian Chamber of Deputies (Italian: Camera dei Deputati) for the district of Partinico for which he was constantly re-elected until 1925. He aligned himself with Giovanni Giolitti, who was Prime Minister of Italy five times between 1892 and 1921. As Prime Minister of Italy, he went to the Paris Peace Conference in 1919. He demanded the fulfilment of the "secret Treaty of London of 1915, by which the Allies had promised Italy ample territorial compensation in Dalmatia for its entry into World War I." However, Woodrow Wilson brought forth considerable opposition to Orlando's demands. Therefore, Orlando failed to secure British or French support. This caused him to leave the Peace Conference. However, he returned a month later. "Even then no solution satisfactory to Italy was found; Orlando resigned and was succeeded as premier by Francesco Nitti. The so-called "Mutilated victory" was used propaganda in the rise of Benito Mussolini. Opposing Fascism, Orlando gave up (1925) his seat in parliament and devoted himself to teaching and writing." He was among the fathers of the Republican Constitution being member of the Constitutional assembly also as speaker of the house. He was a candidate to be the first Italian President elected by the Parliament. Image of French prime minister, Georges Clemenceau. Georges Benjamin Clemenceau (French pronunciation: [ʒɔʁʒ klemɑ̃so]; 28 September 1841 – 24 November 1929) was a French statesman, physician, and journalist. He served as the Prime Minister of France from 1906 to 1909, and again from 1917 to 1920. He is commonly nicknamed "Le Tigre" (The Tiger) and "Père-la-Victoire" (Father Victory) for his determination as a wartime leader. "Succeeding Paul Painlevé as premier in November 1917, Clemenceau formed a coalition cabinet in which he was also minister of war. He renewed the dispirited morale of France, persuaded the allies to agree to a unified command, and pushed the war vigorously until the final victory. Leading the French delegation at the Paris Peace Conference, Clemenceau insisted on Germany's disarmament and was never satisfied with the Versailles Treaty. He was the main antagonist of Woodrow Wilson, whose ideas he viewed as too idealistic." For nearly the final year of World War I he led France, and was one of the major voices behind the Treaty of Versailles at the Paris Peace Conference in the aftermath of the war. Clemenceau was hoping that there would be more punishment put on Germany. While the Allies at the Paris Peace Conference made up more than twenty nations, the Big Four entered Versailles and were leading architects of the Treaty of Versailles which was signed by Germany; the Treaty of St. Germain, with Austria; the Treaty of Neuilly, with Bulgaria; the Treaty of Trianon, with Hungary; and the Treaty of Sèvres, with the Ottoman Empire. During the decision-making of the Treaty of Versailles, Orlando temporarily pulled out of the conference because Italian demands were not met, leaving the other three countries as the sole major architects of the talk, referred to as the "Big Three". The Italian delegation returned after 11 days. ^ "Leaders of the Big Four nations meet for the first time in Paris". history.com. ^ "Why was the treaty of Versailles so significant? – Rise of Hitler and the Nazi party – Year 9 – SchoolHistory.co.uk". schoolhistory.co.uk. ^ Sean Dennis Cashman (1988). America in the Age of the Titans: The Progressive Era and World War I. NYU Press. p. 526. ISBN 9780814714119. ^ a b ALAN, R. (16 November 2002). When Peace Did Not Go Unpunished. New York Times. p. 7. ^ a b Vittorio Emanuele Orlando. (2011). Columbia Electronic Encyclopedia, 6th Edition, 1. ^ Georges Clemenceau. (2011). Columbia Electronic Encyclopedia, 6th Edition, 1. ^ "The Treaty of Versailles". History Learning Site. ^ Beck, Roger B.; Linda Black; Larry S. Krieger; Phylip C. Caylor; Dahia Ibo Shabaka (1999). World History: Patterns of Interaction. Evanston, Illonois: McDougal Littell. p. 760. ISBN 0-395-87274-X. ^ "Italian delegates return to Paris peace conference". history.com. ^ "The Treaty of Versailles". History Learning Site. , See the part:The attitude towards Germany of the "Big Three"："The "Big Three" were David Lloyd George of Britain, Clemenceau of France and Woodrow Wilson of America." Sharp, Alan (2011). Consequences of Peace: The Versailles Settlement: Aftermath and Legacy 1919–bdhdhxhxhxhjxjxjdjdjdjjsks2010. Haus Publishing. ISBN 1905791747. Stevenson, David (1998). "France at the Paris Peace Conference: Addressing the Dilemmas of Security". In Robert W. D. Boyce (ed.). French Foreign and Defence Policy, 1918–1940: The Decline and Fall of a Great Power. London: Routledge. ISBN 978-0-415-15039-2. This page was last edited on 2 April 2019, at 16:11 (UTC).